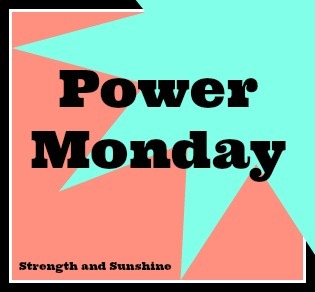 Hey lovelys, Happy Power Monday and Happy Veteran’s Day! Make sure you take a moment and send a prayer, well wishes, or just take a few quiet moments to thank and appreciate our troops and those who served, fought, and died for our country. So with the holidays gaining on us (can you believe there is only 2 1/2 weeks till T-Day?!) everyone seems to be looking for quick ways to get in a nice sweaty workout on limited time. 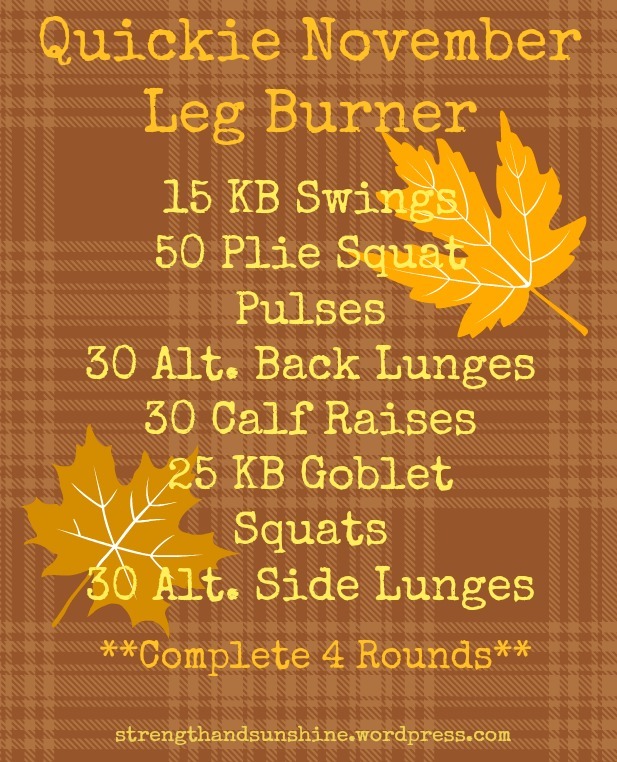 So I created a quick leg burner for y’all to do when you are crunched on time and just need to get in a quick sweat session before running out and on to your other various obligations! + I suggest anywhere from 15-25lbs for the Kettlebell. If you don’t have one, just use a dumbbell! + The other moves can all be done with your body weight, or you can use dumbbells. It is up to you! + The Unfamiliar Moves: KB Swings, Back Lunges, KB Goblet Squats, Side Lunges. + Do these rounds quick, rest minimally between each round. If you are really crunched on time cut it back to just 3 rounds and you will still feel it! Have fun with this one! Let me know how you do and if liked it. Remember to honor you body and perform at you own level. Don’t continue if you feel sick or faint! We are all at different stages of fitness and need to respect that. Now…drum-roll…the winner of the ENERGYbits giveaway is….Keri, congratulations! You should be receiving my email today so I can get your info to send on over to ENERGYbits and they will get you your sample in no time. Do you feel especially crunched on time during the holidays? Thankfully, I don’t. So my workouts, cooking, all things healthy living pretty much stay exactly the same. It just my ingrained lifestyle. What are your favorite online grocery retailers? I love iHerb, but Vitacost is a close second since they always have great savings and discounts. Abe’s Market looks pretty steller as well, but I have never ordered form them yet. Oh this is fantastic, I love quick workouts! Thanks for sharing on the weekend re-Treat link party! Thanks for the workout. I’m always looking for varied ones. Stopping by from SITS. You are playing my song. I always feel crunched for “crunch and lunge” time! So any exercise routine I can squeeze in between writing, reading, cooking, working and other responsibilities is a PLUS for me–so thanks for sharing your Quickie Leg Burner! I have a cruise to get ready for so I better get busy now! Thank you so much for being a part of Live it up at the “Healthy, Happy, Green & Natural Party”!I am delighted that you were a part of this! Looking forward to seeing your wonderful posts again. It is great to have these quick options when your crunched on time! Whipping out a quick session always makes me feel better and think clearer! Looks like a great workout! I sometimes feel crunched for time on the holidays mostly because my family usually travels, so I don’t have the same kind of flexibility I have at home. But I still like to find time to do quick workouts like this one!